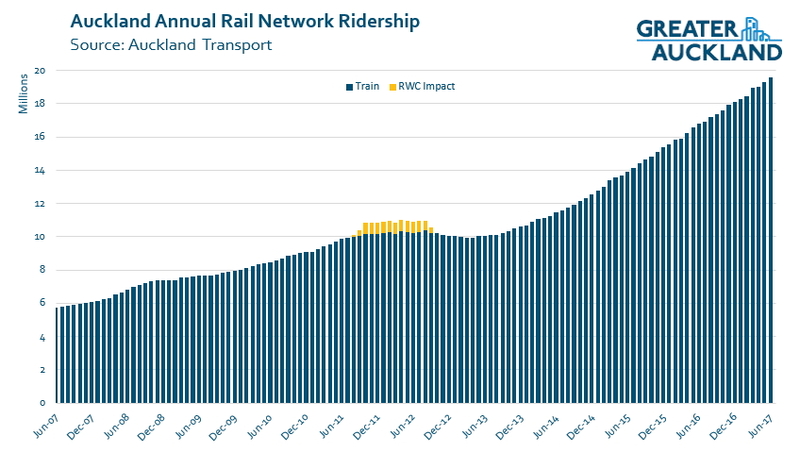 For the last few years now and since electrification of the network, ridership on Auckland’s rail network has surged, jumping from 10 million trips in the year to June-2013 to 19.6 million trips in June this year (and bound to hit 20 million any day now). Now, over 22% of all trips on public transport in Auckland occur on a train, a far cry from less than 5% prior to Britomart opening in 2003. Usage has grown so fast, and faster than anyone expected, that Auckland Transport are now rushing to buy more trains to cope with the demand. The rail network, along with the Northern Busway, has helped to show that when relatively fast, frequent, reliable and high-quality services are provided, that Aucklanders will flock to use them. But we love to know not just that the use of the network is growing but also where it’s growing. 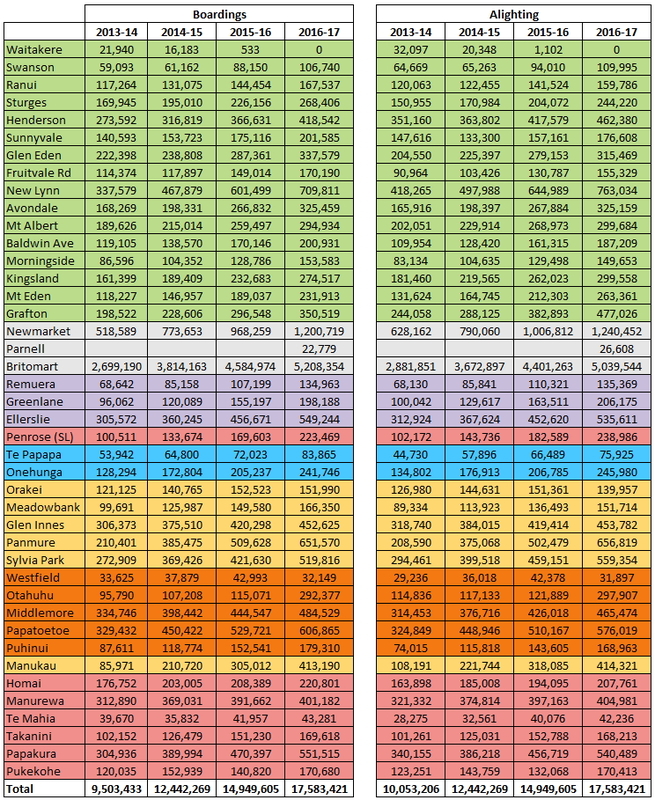 Once again, Auckland Transport have kindly provided us the numbers breaking down the rail results by station. This includes how many trips are from each station to every other station on the network. You can see last year’s post about it here. The table below includes all Tag-On’s and Tag-Off’s at each station. Before delving into it a few caveats. The rail trips only count completed trips i.e. where both the origin and destination are known. This means trips where someone has forgotten to tag off, trips on some passes like the child monthly pass (a paper ticket) and special event trips aren’t included. The trips included below account for about 90% of all rail trips. The boarding numbers don’t include transfers i.e. where someone gets off a western line train at Newmarket and transfers to a Southern or Onehunga Line train. The Westfield numbers are even lower than usual as the station closed late last year. Britomart has broken through the 5 million boardings annually mark. In total, around 58% of all trips begin or end at Britomart. Downhilling from Grafton remains popular with over 100,000 trips difference between those boarding and those alighting – downhilling is where someone gets off a bus/train at the top of a hill then makes their way to a station at the bottom so they don’t have to walk back up the hill. Orakei has declined in usage. The numbers show that trips from there to Britomart are down significantly, likely the result of the station no longer being a 1 stage fare to the city. Positively however, while those trips have dropped, trips to other parts of the network have increased. Usage of Te Mahia remains significantly lower than any other station on the network, as it has been for a long time (except for the recently opened Parnell). The graphs below look at how usage of stations have changed in usage over the last year. The colours represent different lines and where they overlap. 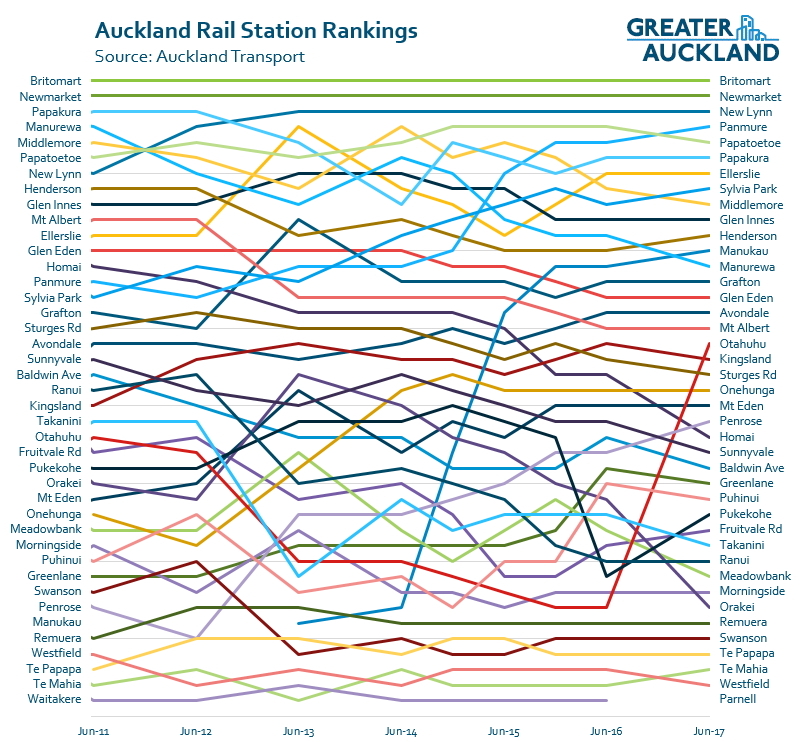 Britomart once again leads the way the highest individual growth, which helps to distort the graph, but other stations have improved more in percentage terms. Not everything was positive though with boardings from Orakei ridership stalling. The next graph shows the change in each station as a percentage. Most stations tend to hover around the 10-20% mark but as you can see, Otahuhu has been the big mover in this year’s results to the point of distorting the graph with 154% growth. This follows its impressive upgrade last year and also being an interchange as part of the new network. Manukau also continues to see strong growth and I’d expect that to continue once the new bus station has been completed. At the other end of the spectrum, we continue to see very low growth out of Te Mahia and that’s already of a very small base. Lastly, here is something we like to call the Rankings Rug. It’s called the rug as it kind of resembles some abstract weave on a rug. For each year we’ve ranked each station based on the number of boardings they had and it gives an interesting perspective on how stations have changed over time. For example, it allows us to see the impact of a new or upgraded station. For the purposes of this it only goes back to 2011 as prior to that the changes in rankings are much more common and it makes the chart harder to read. 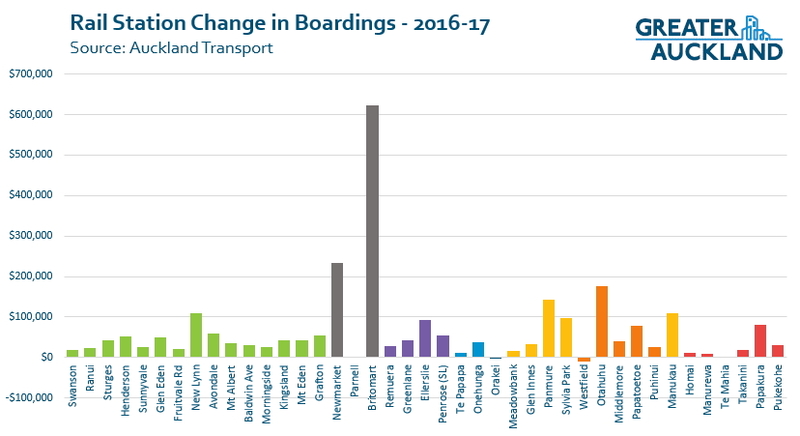 Otahuhu’s upgraded station and corresponding ridership growth has seen it shoot up the chart. The upgraded station only opened at the end of October but based on it’s usage, I’d estimate that had it been completed had a full year it would have displaced Grafton. Orakei has seen the largest drop, reflecting the comments above. What do you make of the station usage results? Note: In the past AT have provided us with the Busway station stats too. At the time of writing this I hadn’t received those but I’m hoping I will. Interesting to note that all if not most the Southern Line stations have increased in usage. Guess we can pinpoint that to the New Network! Almost all the growth on the Eastern Line has come from Panmure. Be interesting to see what happens at Henderson & New Lynn with the Western New Network and now the former is gated. Wow Parnell is a disaster. I’m not surprised given the station is hidden away so terribly badly. Who chose such a dumb site? I think you’ll find that Mike Lee has had a bum rap here. The siting of Parnell is purely down to AT. See Simon Wilson’s article in The Spinoff. Yes Harrymc, you are correct. Ill informed do attempt to label Parnell all about Mike Lee, but Simon Wilson actually rebuffed the baffoon who had earlier published a piece in Spinoff. Clearly Simon Wilson is a professional, unlike the other young author who only has grudges to display. Also, more trains are to stop at Parnell in the future, but not yet. Won’t make it great necessarily, but currently its a “damned if you did (open it), damned if you don’t (open it, but already have most of the infra in place). Manukau had very good staff handling entry and ticket problems ,,, where are they now ? it would be great if they could tell us what size train is turning up to the platform . I take it a 3 car is the small train ? Manurewa seems to be bombing a bit. I wonder if that is going to change when the gates go live? The stations connected to a Metropolitan Centre seem to be continuing to do well as well. Not sure is bombing is the right word for rewa, but stagnation. New network has not helped this or homai station at all. Manurewa has such a big catchment but is not growing. It seems that it is not attracting new customers. I wonder why? The scum who frequent the area between the bus station and the railway station???? Lack of growth and growth allowed under the Unitary Plan is Manurewa’s biggest problem. Not sure I agree with u on that one. The wattle downs service is worst. Plus the peak buses finish at 6. This is madness. The weekend timetable does not line up with the trains. I think more needs to be done to improve things. Apartments in rewa town centre would help. But better off peak buses would help. The feeling that rewa bus station is not safe does not help. But I think there are some other reasons as well. Just not sure what they are. None or rewa 3 train stations are growing much but others on the southern line are. I wonder how many people in rewa work at locations that the southern line service. Perhaps many work at the airport, manukau, locally or botany/highbrook area? Overall a good news story, but doesn’t this show how critical micro-level location and access is to patronage. It can vary by several orders of magnitude. Parnell must be less than most bus stops. In a high density area, the location has been a disaster. People have not learned to transfer there or have no reason to. New Network should make that slightly better with a more consistent and slightly more frequent all day bus timetable? After consultation the transfer to train here was watered down though, more buses all the way to Britomart were retained. I think it’s mainly no reason to. From the Eastern Bays it’s generally quicker and more convenient to get a bus to the CBD than to Orakei because of the 770/771’s winding route. and infrequent timetable. For those east of Mission Bay the NN will remove any direct bus link to Orakei station anyway, although you could get to GI on the Blue Link. The car park at Orakei is regularly full by 7:30am, to the point where the verges are being destroyed by cars. How did all the extra people get there last year? Pedestrian crossings on Ngapipi and Orakei roads would definitely help, for such a scenic area it’s spectacularly unfriendly for pedestrians. 1. Parnell must be completed as per the original plans linking both sides to Parnell Rise and shops with bridges and Carlaw Park Lane directly, with ALL trains stopping. If the half arse budget model is to persist, close it as it is a total hinderence to efficient train services. 2. Orakei proves that charging a 2 stage fare for that short distance makes car use more attractive. That is a fail and flies against PT objectives to get people out of cars. It needs to go back to single stage status. 3. Te Mahia is the least safe feeling platform in the entire network and it does not surprise me that so few use it. Relocate to somewhere more open and make it safer. If that Orakei Bay Residential project gets off the ground, I would expect patronage at Orakei to improve in the future. Alternatively, AT should sell the park and ride, and Panuku develop it with the private sector for mixed use (including residential) purposes. Would provide more passengers than the PnR. Although residential development is a good idea especially for investors and there is room around the platform at the moment to do so, closing the park and ride will make Orakei even more pointless. It does take vehicles out of the city at the moment and that is a good thing but its losing its potential. Orakei car park has room for about 190 cars. Closing it doesn’t seem like a big deal. The CRL is going to make it a lot more useful in future. I’m a local resident and we often use the Park N Ride in the weekends already. Getting to Sylvia Park is a prime example. By 2021 you’ll be able to get a lot of places quickly from Orakei station which will make it very attractive as a “gateway to the city” for eastern suburbs residents. Yeah it would be pretty easy to make Orakei a grey blob on the map so it’s in both the CBD and isthmus zones. The train station is effectively an island so easy to do without screwing up the zones. Te Mahia is going to get 600+ new houses on its doorstep shortly and AT have plans to open up its frontage onto GSR whilst also giving the station platform a much needed makeover. Give it 5 years and it will be climbing the league table. Doesn’t it depend on where those people are working though? I’m not sure 600+ houses in that location will generate that many rail trips myself. Hope I’m wrong! Not sure where they’ll all work but you can be sure, like a huge number of South Aucklanders already, they’ll be sending their kids to schools in the city. Te mahia patronage to double in 5 years, put your mortgage on it. Orakei to Britomart costing the same as Slyvia Park to Britomart doesn’t feel right to me. How do you know that? It is entirely feasable people who live further out are no longer driving to Orakei and are instead catching the train at GI, Panmure or Sylvia Park. In the absence of other information, I think it’s reasonable to believe that changing the fares had a part to play. If I was to make a call, I’d first reduce the fares to 1 stage, improve pedestrian access and coordinate better feeder buses. Then when ridership has increased I’d replace the park and ride with mixed use development including housing and public spaces. I don’t doubt that the fare change has reduced the ridership at Orakei, I’m questioning whether it is causing people to drive to town. I suspect it is mostly people who used to drive a longer distance to Orakei to get a cheaper fare now just going to their closest station, this reduces traffic. One of the reasons for changing the zone was to reduce the appeal of a heavily subsidised carpark near the CBD. The best hope for Orakei is being on a frequent bus route as it was in the initial NN consultation. The zone is somewhat moot in this case as most people would catch a bus from somewhere in the second zone anyway. Auckland’s fares and fare zones are a mess – you can travel from New Lynn to Panmure and AT will charge you $1.85. But if you start from Devonport to the same destination it’s an astonishing $7.75 for a much shorter trip. It’s inexcusable that this state of affairs has been allowed to arise. The answer is simple, and that is to have a single flat fare for all Aucklanders as has been done successfully in Stockholm and Paris. Our council needs to be far more proactive in encouraging public transport, and making the cost of using public transport fairer for all would be a great step forward. I’m not sure someone paying the same for a trip from Pukekohe to the CBD as a trip from Ellerslie to Newmarket is really ‘tidying up this mess’. To balance the books the short trip would have to be quite expensive. I think a trip from Lower North Shore to Isthmus should only be a two zone fare though as they are pretty much side by side it’s just all the routes force you through the CBD. A flat fare might have a place, but I’d hate to see someone doing several errands over a few hours in a small area charged multiple times what a commuter coming a large distance would pay. In other words, it would have to be a flat fare for a five hour period or so. What annoyed me about the recent change to larger stages is that it was reversing the improvement to smaller zones we’d had a few decades ago, as if there was no memory of the rationale behind that change. Larger zones with bigger hikes in fares when you cross the boundary make for many more inequities than smaller zones with smaller hikes. The downside of this was masked by the improvement offered by the integrated ticketing. Thats intentional David. It’s effectively a subsidy on crosstown routes and charging relatively more on radial ones. I think you can see it reflected slightly in the rise in numbers of Meadow Bank, MB took back some of it’s rightful coverage. 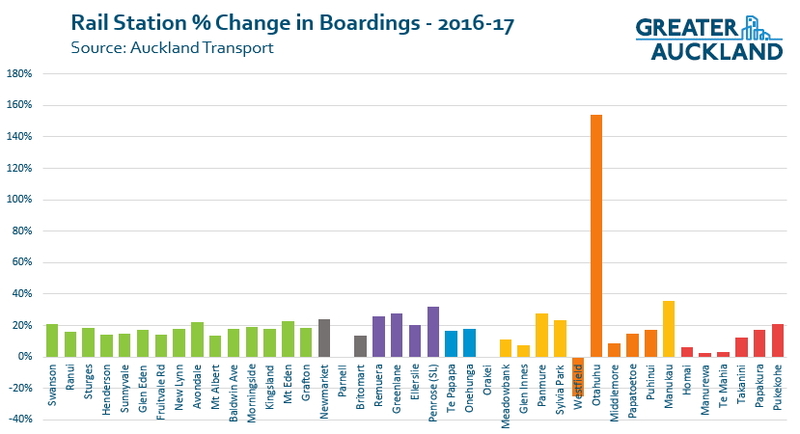 Also interesting the sudden difference in Orakei’s alighting’s compared to boarding’s of recent years, was more matched in the past…not parking there so much I guess & busing back home etc. In general what are the constraints on future growth: More physical trains? Better access by bus? Improved parking near stations? Ticket prices? Other? BTW if I was an investor I would look at these figures and rush to Otahuhu looking for opportunities. Ha too late, many investors have cottoned on already; there will be a gradual change in land uses between the station and the town centre in the near future. I’ll open a coffee shop aimed at investors: call it the gambler with free wifi and a wifi printer and scanner; it will need medium sized tables and a few quiet cubby holes. Or maybe something quite different aimed at building workers and call it ‘muddy boots welcome’, sell tea by the litre and keep the spoons chained to the counter. Maybe. I think it’s a dead duck myself. You can see that from the trends: it’s been growing so much slower than other stations. The microeffects of poor location are hard to remedy even if you increase the catchment. The totals boarding and alighting for three years were identical? What happened in year one where they are different? Did patrons get gobbled up by the Metro? There were more alighting than boarding. No one was gobbled, but a few were cloned. Portable 3 D printing machine maybe. Yep, the way it works in Paris and Srockholm is that you have a flat all-day fare that provides universal and unlimited travel in the city. I think that this would definitely improve the situation of students and workers coming into the CBD from Pukekohe, and would reduce traffic all along the southern motorway. The longer the trip replaced, the more pollution we are reducing. Jezza is right – there would be a trade-off, especially for one-off inner-city trips, but sooner or later we have to start thinking about designing a lot more equity and fairness into our transport systems. Would you be able to post the excel file please? I would like to play around with the numbers a bit. Also, why is it “Penrose (SL)”? Presumably SL stands for Southern Line but why is that specified? Given that Penrose also has a platform on the Onehunga Line, it seems reasonable to assume that “Penrose (SL)” indicates that the figures given are for the Southern Line platforms only. However if this is the case, what are the figures for patronage at Penrose (OL)? There is no data given for this. Yes wanted to know this last two years also…..Speaking of Penrose, Interesting to see the steady rise of it in the rankings, seems to fit with what I see anecdotally. Yeah why isn’t there a “Penrose (OL)”? And why would you make that distinction for Penrose and not for all the other stations on multiple lines? I would say the distinction is that all other stations which are on multiple lines have the lines sharing the same tracks/platforms, so “station-patronage” is accepted as being the sum of the individual lines. However at Penrose the SL and OH platforms are discrete and behave more as separate stations. But puzzling that the Penrose (OL) patronage is not counted. Does this mean the total boardings/alightings figures are wrong? Alistair, if you get that Excel file have a look and see if it is included there. Did anybody ever get the excel file for this, either from GA or manage to find it at AT? I’m now thinking it’s just an aberration/admin error of how they display it. The figures are probably combined after having a separate Excel line initially, but they didn’t remove the “(SL)” reference?? So it’s most likely total of the strictly southern line platforms AND the 3rd one to or from Onehunga surely (doesn’t count any transfers as per anywhere else). Remember platforms 1 & 3 both go to or from Britomart. It would be good to have a breakdown of the platforms though to get some idea of numbers catching the now limited services run in on the Onehunga line. Generally people would tag at the relevant platform, but may move to the other when they realise they have missed a train etc…..not thinking from experience of course…cough…cough. My guess is they just combine it (it’s what I would do in this situation) but they forget to remove the label. How much would it cost to move Meadowbank towards GI more? Behind Selwyn College link with bus routes on Gowing Drive giving a lot better catchment & even the rail buses could service it then! The GI to Tamaki cycleway (actually a shared path) will hopefully provide a link with the Selwyn College / John Rymer Place side of the valley with Meadowbank Station. I say hopefully because the links were not part of the original funding, but the Orakei Local Board has been pushing hard for links to John Rymer Place and Gowing Drive. Should they eventuate, Meadowbank Station will become a 15 minute walk to a lot larger catchment. ahhh good to know, yes that should help the situation a lot. The John Rymer Place link has been agreed, which will usefully extend the walk-up and ride-up catchment for Meadowbank Train Station across the Pourewa Valley to parts of Kohi. This will include Kohi Road and adjacent streets from St Heliers Bay Road to Eastridge shopping centre, including Selwyn College / ASB Stadium. Fingers crossed for additional links including the critical southern connection into Gowing Drive… the OLB and Orakei Ward Councillor are pushing hard for this. Grant, a strategy more realistic of success would be to support the push by the Orakei Local Board to link the Glen-Innes to Tamaki Drive shared path to Gowing Drive. The OLB is fighting hard for this but is up against AC and AT bureaucratic inertia and funding constraints. This would provide a more direct connection between Meadowbank Station and the Gowing Drive area, as well as directly linking the Gowing Drive area and Selwyn College etc. up the hill via John Rymer Place, alleviating localised traffic congestion. When the consultation for Stage 4 begins, I suggest you mention that you support the Gowing Drive and John Rymer Place connections. Either way, the GD and JRP local connections for this project are worth fighting for. It will dramatically improve the local accessibility to the shared path, and hence the path’s overall utility. Tbh even if you moved the station it wouldn’t have a good catchment. Those suburbs aren’t particularly dense and they face away from the rail line. Improving walking/cycling links is the key regardless of where the stations are. Indeed Grant, the NZTA designed this path as a through route and is expecting the local board to pay for the local connections, ignoring some of the major benefits of the project (providing an alternative to local traffic congestion). The OLB, to their credit, has fronted up with as much (limited) budget as they have, but the costs of working around the rail are such that Council funding is needed. Contact your Councillor and submit on stage four if you think the Gowing Drive connection is a good idea. …and speaking of short-sighted cost cuts, stage four of the path (Orakei Station to Tamaki Drive) is now planned to take a long, winding route for cost reasons. It’s such a shame, a brilliant piece of infrastructure is being compromised to save what is (by government standards) a few bucks. Madness. Yes hope they get these connections, think they want local board to pay for these mainly from memory? Can see that linking across the rail & the creek would be key to unlocking the locals to use this. I’d like to see these numbers against population growth – and it would not be hard for AT to do. Growing patronage and strong population growth (and increased road congestion) go hand in hand – so a growing percentage of people using PT is what we really want to assess. Not per station, but that would be really hard to do in any meaningful way because population growth isn’t uniform across the city. Thanks, so by the looks of it, per capita public transport movements are only back to 1990 levels – hardly a ringing success yet, a long way to go…I guess the period through to the 1970’s would have been influenced by the relative expensiveness of cars back then. Rail patronage however has been growing at a much greater rate and is probably as high per capita as it was in the 1940s, if not the highest ever. Parnell station will be fine. A reminder about services there. •All Southern Line trains stop at Parnell. •Western Line trains stop at Parnell after 7pm week days and on weekends. •Onehunga Line trains do not stop at Parnell. When the station is in full use, construction is completed and becomes more established it will shoot up the rankings. tbh I’m surprised Parnell is doing as well as it is, given the current poor access. Usually see a dozen people waiting or walking from or to it when my train goes past in the morning. The Te Mahia station just needs a serious upgrade for safety and access. With 500 new homes being built across the road at Waiata Shores Development and the cycle/walking path linked through to Wattle Downs demand will increase.